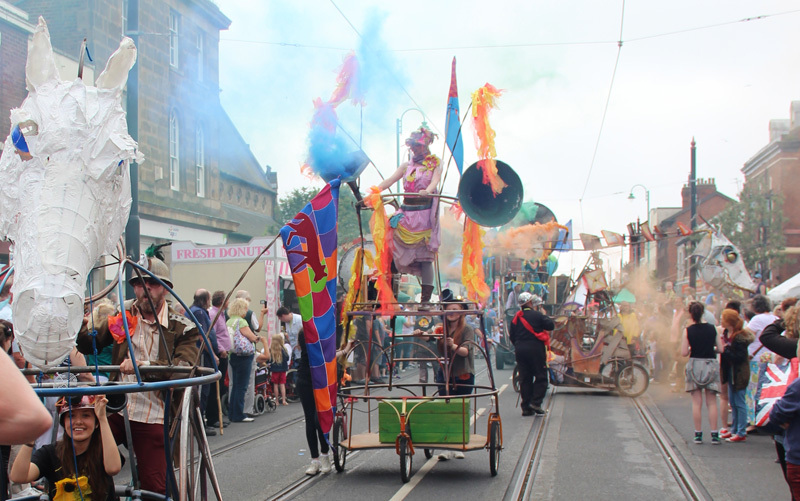 Burning Bright is a night-time procession for street, town & festival sites. From the forests of the night and the sinews of the heart comes a scrapyard menagerie of illuminated beasts & creatures accompanied by musical towers, performers, lights, & pyrotechnics. 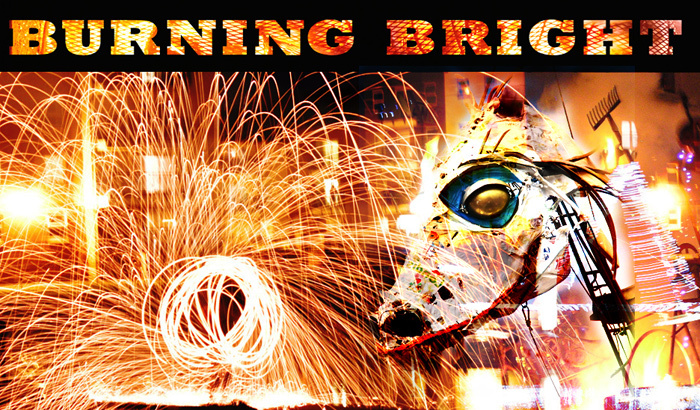 Forged in the wild places of the human imagination, Burning Bright combines high intensity animation of beasts & puppets; live music and sound and dazzling, atmospheric pyrotechnics. This is a bestiary that roars out from the page and onto the streets in a constellation of energy and delight. Contact Us for more detail, pricing and tech specs. 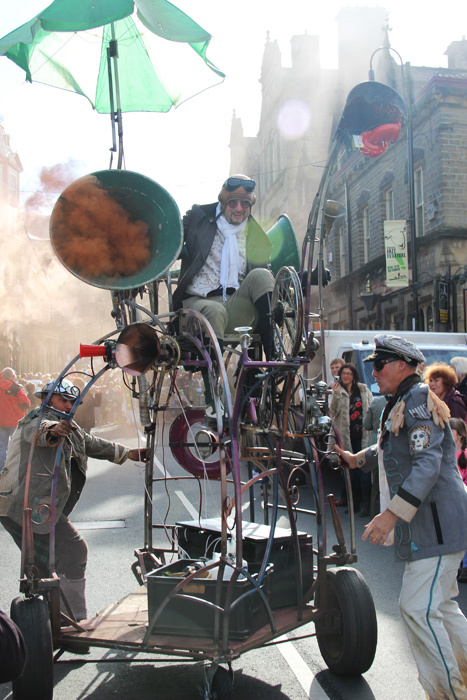 Skimmity is a processional delirium of wild music, mobile towers & sound sculptures, pyrotechnics and performers. Drawing on traditions of noise in ritual and celebration, free jazz, street music and sound art, Skimmity brings a right riotous racket to your streets. It’s a busy time of year for Rag and Bone – no resting on our worn out laurels in the Boneyard. 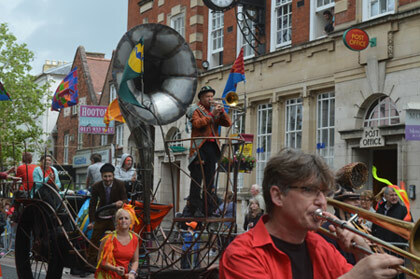 Tim Hill and Geraldine Giddings organised the Endless Parade – a 1 day conference in Taunton, Somerset exploring parades, processsions, carnivals and other mobile transports of delight. Rag and Bone were there with some of the procesional devices, mutant bicycles and mobile beasts we’ve made in the last year or so. 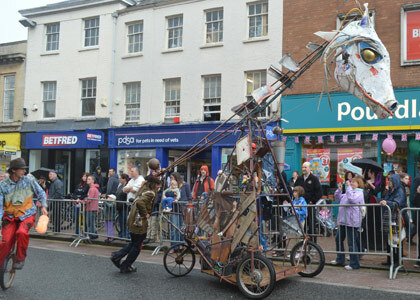 Two days later on 15th June we were a core part of 2 processions for Somerfest in Taunton town centre, along with Mike Pattison from Kinetica and his amazing contraptions from the Paralympics Closing Ceremony, and the The Big Noise. Much fun was had by all, including participants and an unsuspecting public. 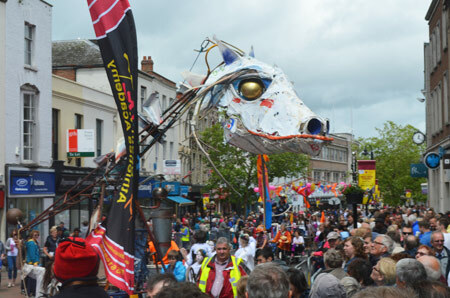 We’re hoping this can turn into a regular event – here at Rag and Bone we delight in seeing town centres full of colour, fun, mayhem and a joyful noise.